Online Registration is now Closed...There is limited seating available. Please call the YFC office at 631-385-8333 for reservations. Tickets are not available at the door. Our *60th Anniversary* Celebration banquet is Friday, April 5th, 2019 at 7 pm! 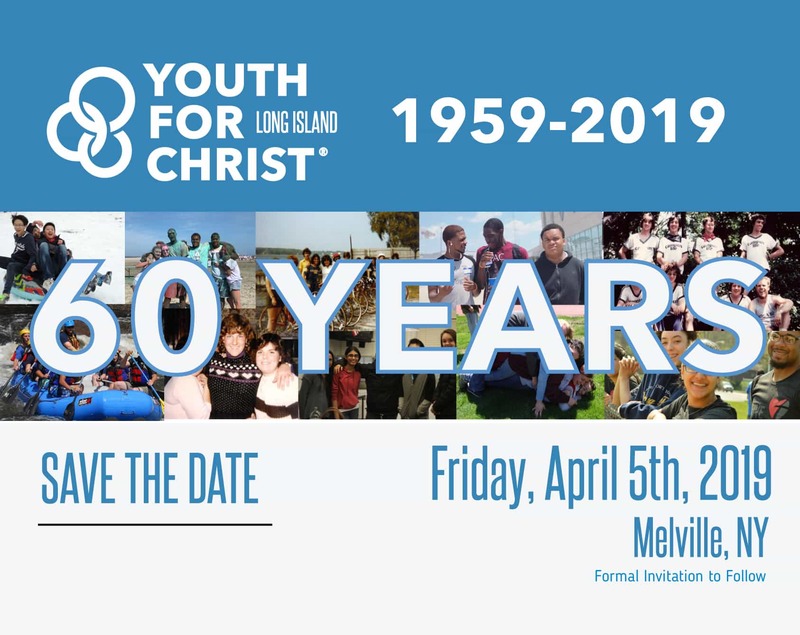 Save the date for our 60th-anniversary banquet, Friday, April 5th, 2019! Youth for Christ began on Long Island in 1959 and we have not stopped sharing the love of God with young people. We will also be celebrating 75 years of Youth for Christ USA that started in 1944! This will definitely be a night to remember. We are calling all alumni, former staff, volunteers, board members, prayer partners, parents, and more to come! *Do you have a business or want to be featured in our 2019 LIYFC Journal that is featured that night? Click HERE to sponsor and get your business or message out there! * Please note that we are no longer able to take NEW Journal Donations/Requests. *Sorry, Tickets are NOT tax deductible. To see a great video compilation of our 2018 Banquet, click HERE. Can't come to the Banquet, but still want to give? Click HERE to donate today!